The hope and optimism following the 2011 revolution that took place in Egypt have been replaced with anger, despair and disappointment. The majority of the Egyptian population is struggling due to dire material conditions that are causing immense suffering. For many, increasing authoritarianism and the stronghold of the ‘Deep State’ is of profound concern and is perceived as a return of oppression. This pessimistic situation is a repetition of the circumstances following the Egyptian revolution of 1952. This essay will explore the effects of colonisation on subjectivity, effects that have been profoundly internalised in Egypt, despite the arguments or pleas that assert the opposite. By focusing on exploring identification and inter-generational transmission I aim to draw out how history persists in the present and how the weight of the past paralyses the possibility of forging a future based on social justice and equality of opportunity. The essay focuses on issues of identification and generational transmission in order to look at how a colonised past persists relentlessly in the present. January/February 2011. I watch in delighted disbelief as the demonstrations across Egypt increase. I simply cannot believe the number of people on the streets protesting against the Mubarak regime; as my brother wondered with heartfelt joy, ‘whoever would have believed this would happen in our lifetime?’. I feel increasing confidence that a new future is there for the making as, all across Egypt, city centres teem with men and women of different classes, ages and faith demanding ‘bread, freedom, dignity’. I am filled with enthusiasm, faith and conviction that a new Egypt will be built. July 1952. A group of Army Officers called the ‘Free Officers’ and led by Gamal Abdul Nasser has undertaken a coup d’état that will lead to the overthrow of the government, the monarchy and, above all, the British. Decolonisation promises independence from the past and ‘a blessed future – a future whereby colonial exploitation would be replaced with economic “development” and social “progress”’ (Go, 2013, p. 5). My Egyptian father is confident, hopeful and secure in the knowledge that Egypt is on a firm footing to develop into a society based on social justice. However, we are both to be profoundly disappointed. In February 2011, following the ousting of Hosni Mubarak and his leading followers, including politicians and business leaders, an important socio-political space developed in which it might have been possible to create a different society based on social justice and equality. There was excitement, hope and a profound belief that Egypt would become a more just and equal society. This short-lived period of optimism echoed the fervent excitement following the 1952 revolution. When the British ruled Egypt (1882-1952), they exercised considerable power in Egyptian affairs, and their involvement in the political, social, economic and judicial life of the country was pervasive. Egypt was a veiled protectorate and not a colony, not due to honourable considerations, but rather because of sensitive international concerns. The Governor Lord Cromer, Earl of Baring, considered the Egyptians to be a subject race in need of leadership. He strongly believed that autocratic rule was necessary because the people of these countries were used to ‘despotism’, arguing that you cannot make a ‘Western silk purse out of an Eastern sow’s ear’ (Osman, 2010, p. 8). Following the 1952 revolution, the period of optimism lasted longer. Both the former revolution and that of 2011 were marked by an aftermath in which Egyptian citizens felt despondency, despair and profound disappointment, and both revolutions have been characterised by a failure to develop a society based on social justice. The repetition of affect in the wake of political failures is striking, and these recurrences of political failure cause anxiety and provoke concern. Such repetition is both troubling and troublesome. The initial impulse that propelled me to start to try to understand political authority, or the absence of it, was ignited when I saw my father unable to stop weeping over the failures of the 1952 revolution. Bearing witness to my father’s tears, whom I had never seen cry, I was puzzled by the way he was torn apart by his overwhelming feelings of responsibility and disappointment, yet I find myself now in a similar emotional and political place and space. Repetition – emotional, social, political – may be more prevalent than we are willing to acknowledge in the relentless drive to assert our differences from previous generations and our insistence on progress. There are, regrettably, more similarities between present and past than we are often willing to recognise and realise. My generation is profoundly disappointed, as was my father’s generation, and our distress is full of loss and the absence of hope for a society based on equality of opportunity and the eradication of gross poverty. The persistent assertion that the past is done with, overcome and behind us, is seemingly a fantasy based on illusion. I am here concerned to explore a number of aspects of the socio-emotional complex in Egypt that impede at best, and/or paralyse at worst, the establishment of a society based on social justice. I concentrate on interior, psychic life as one route toward a deepening understanding of the dire state of contemporary Egypt. Dominant theorisations tend to converge on structural inequalities such as the global economy, imperialism, historical events and the inglorious role played by the UK, European nations and the United States. While these understandings are valuable and valid, they do not provide a full explanation, which, I argue, requires a focus on such interiority. As Nadje Al-Ali (2014) argues, we must ‘look inward, name and confront those attitudes, norms, practices and relations that cannot be simply explained away by external and structural patterns, forces and processes’ (p. 125). I will endeavour to open up and explore aspects of a post-colonial subjectivity formed within Egypt, a country that has a long history of being colonised. Looking inward requires opening up an exploration of matters of subjectivity in an effort to avoid perpetuating denial and the insistence that problems are all external. Furthermore, doing so attempts to restore full subjectivity to Egyptian citizens and to pay full due to Fanon’s (1986) plea that conceptualisations of interiority take into account the more disturbing and negative aspects of human beings. Colonisation does not, alas, just float on the skin, but rather goes to the heart of human beings as the other’s contempt, denigration and refusal are taken in and affect various aspects of human life: the capacity to speak confidently with the pronoun ‘I’; to recognize self and other; to inhabit language; to live a life with confidence rather than from a position of perceived ‘inferiority’; and to work toward building an equitable society. As Fanon poignantly expressed it, ‘[a]ll I wanted was to be a man among other men. I wanted to come lithe and young into a world that was ours and to help build it together’ (p. 113). Postcolonial theory works on a double edge, simultaneously attempting to understand what occurred and imagining what might, or should, have been. Such theory focuses on working toward uncovering memories, acts of resistance and socio-political complicities in order to imagine a different reckoning with the past. Within a postcolonial theoretical framework, the past is conceptualised as intangible but exerting substantial effects. History is a burden: it persists in the present, is full of emotional textures and has to be endured. The past has a tenacious grip. Egypt’s long history as a colonised nation (colonisation by various nations that stretches over five centuries) is her burden, despite persistent claims that the past is only that – the past. On January 25th 2011, Egypt erupted in political activity. Midan Tahrir (Liberation Square) was taken over by protestors who cut across lines of class, gender, age and religious faith, all demanding the resignation of the then President Hosni Mubarak and his government. This regime was widely perceived, with good reason, as motivated by self-interest and corruption. Mubarak and his government were experienced as severely inadequate due to their failures to tackle the acute problems from which the Egyptian population was suffering. Unemployment was soaring and the majority of young men under 30 were unemployed. Inflation was high, and manufacturing was in severe decline, leading to the closure of many factories and businesses. In addition, education and health provision were in a dire state: for example, the shocking decay of public hospitals, illustrating the inefficiency and corruption of governmental administration. Above all, the corruption of central government, exemplified by the decision to install Gamal Mubarak (Hosni Mubarak’s son) as the new President, led to public outrage that had, moreover, no impact whatsoever on the decision. It was clear that the Mubarak family and their supporters would do what they wanted without consideration of the consequences or impact on the Egyptian population. When Hosni Mubarak was interviewed on television about the increase of public political activity taking place, he contemptuously replied, ‘let them play’, little imagining that the people’s political demands would significantly increase and lead to his resignation in February 2011. In a state of excitement, optimism and disbelief, the Egyptian population witnessed these socio-political events and could not believe our good fortune. Egypt, we were convinced, was on the way to equality and social justice. Since January 2011, the political situation in Egypt has been complex, fragile, and turbulent. Yet, in a seeming paradox, little has changed. Following the ousting of Hosni Mubarak, the Supreme Council of the Armed Forces took over the country, promising that it would be an interim government only. A new constitution was written and presidential elections were held that led to the election of Muhammad Morsi of the Freedom and Justice Party (the political wing of the Muslim Brotherhood) as President. Staggeringly quickly, however, the Muslim Brotherhood established rule with the same repressive determination as the Mubarak regime. Within three weeks of coming to power, Muhammad Morsi was shouting on TV that he would not tolerate any dissent from the views of the Muslim Brotherhood. Under the latter’s jurisdiction, a new constitution was put in place that excluded women and Christians and made clear that Egypt would be ruled entirely by a particular interpretation of Islamic law. There had been promises that the Senate would be inclusive and contain Christians, Muslims who did not belong to the Muslim Brotherhood, and women, but this did not occur; only men who belonged to the Muslim Brotherhood constituted the Senate. Violence against women escalated, especially against those who did not wear the hejab; suppression of political views that did not conform to those of the Muslim Brotherhood increased to a worrying degree, and there was little, if any, attempt to repair the corruption and decay of the Mubarak regime. Indeed, in November 2012, Morsi gave himself unprecedented powers and it was clear that the Muslim Brotherhood would not countenance another election. Egyptians, on the whole, were disappointed, and many depicted the revolution of 2011 as the Stolen Revolution. Political activity, which had been ongoing, increased again and many Egyptian people began to demonstrate in large numbers against the Muslim Brotherhood with fervour and intent; moreover, the demonstrators now included individuals who had voted for the Muslim Brotherhood eagerly and without hesitation. Ordinary citizens were dismayed by the incompetence of its rule, and, equally important, were aghast at its selective interpretation of Islam. The then Field Marshall Al-Sisi offered to broker an agreement, ‘but the Brothers flexed their muscles, deploying armed supporters to clear the anti-Islamist sit-in around the presidential palace in December 2012, killing and torturing dozens in the process’ (Kandil, 2014, p. 15). The protests culminated in demonstrations that in Egypt (if not elsewhere) were unprecedented. As Kandil (2014) pithily puts it, ‘[m]illions took to the streets, not once, but three times in the space of a month: to rebel against Morsi on 30 June, to celebrate his overthrow on 3 July, and to express their defiance of Islamist violence on 26 July’ (p. 15). In June 2013, Islamists set up camp outside the Rabaa al-Adawiya mosque in Cairo, and other camps were also set up. Egyptian citizens were appalled and frightened by the presence of Islamic groups, including Al-Qaeda, who flew their black flag openly. The hate speeches that poured forth from the camps against ordinary citizens were terrifying and worrying. For these reasons most Egyptians accepted the massacres, albeit reluctantly, that took place in clearing the camps. Since the summer of 2013, many active Muslim Brotherhood supporters have been put in prison and oppressed once again. The military is once again in power and Abdul Fattah Al-Sisi is the President (on the basis of a 48% turnout, and a 97% share of the vote). He is loved by many Egyptians and admired for his good looks, urbane dress and his ability to rule with leadership and authority. Many favourable analogies are made between Al-Sisi and Nasser and both are represented as fathers of the nation. Memories of Nasser challenging Britain and winning the Suez War have been revived and provide ballast for a potent belief that Egypt will take its rightful place as the nation in the Arab world. These memories and narratives are reinforced by a massive new project to extend and widen the Suez Canal in order to increase the number and size of ships that can use it. We watched the extensive news coverage of the unveiling of these plans, and, while we knew the coverage was carefully orchestrated, we wept with relief that plans were being followed through to ensure that Egypt will be prosperous again. The reasons for Al-Sisi’s popularity are numerous: he is a member of the military, which is widely respected; he is perceived as beyond corruption and as a leader who can act; and, above all, it is widely believed that Al-Sisi will follow in Nasser’s anti-imperialist footsteps and ensure that Egypt will be admired once again. marked by continued exploitation, violence and global inequality. Furthermore, political decolonization did not herald the end of the West’s power over the globe. While colonial relations of power officially receded, the older power relations simply took on more subtle, insidious, and even more potent forms, variously called “neo-imperialism” or “neo-colonialism”. The dominant discourse that Egypt has overcome the past is prevalent. For example, Mubarak called upon, and powerfully reminded the Egyptian people of the place of the President as the ‘father’ that is commonplace in the Middle East – with all the resonances of patriarchal law at the level of the nation and the family. But he called upon in turn the memories of another possibly more powerful ‘father’: Nasser and the rhetoric of the Nasserite era. Much talk then centred on the restoration of Egypt’s glorious past, and embedded in these beliefs was the possibility of greatness again. ‘Dignity for Egyptians’ and ‘Glory be to Egypt’ were the rallying calls of the time along with the activity that took place to claim political authority, which partly focused on reclaiming the Suez Canal. The important success of Nasser in 1956 over the Suez Canal – defence against the aggression mounted by Britain, France and Israel – was heralded as a trouncing of imperialist nations and specifically the defeat of the British. This bold political move was greeted with hope and the profound belief that this would be the beginning of the Arab region’s ascendancy. The Egyptian people thoroughly believed Nasser’s declaration that ‘[w]e got rid of colonialism, British occupation, we are not going to accept by any means another sort of colonialism, another sort of collective colonialism, however it is disguised’ (quoted in Alexander, 2005, p. 88). Egypt’s military is admired, revered and respected because of the role it played, specifically in 1952, in overthrowing British colonial rule and the Egyptian monarchy. This example of the assertions by both Mubarak and Nasser is provided to illustrate that the claim that the nation – Egypt – has been rescued and is now a postcolonial nation has been used by different Presidents with powerful effects. Interwoven with this reassuring narrative is the claim that the past has been overcome and therefore the injury and humiliation caused by colonialism has ended. Profound difficulties, however, endure at psychic and social levels, and these empty assertions at best hinder a confrontation with how the past refuses to go away, despite all claims and hopes to the contrary. The editors of a special issue of Feminist Review entitled ‘Revolution’ assert that affect and fantasy are vital to understanding our investments in certain forms of representation, as ‘memory and desire play their part in the construction of history for all writers, in terms of both what is side-lined and what is recuperated’ (Andrijasevic et al, 2014, p. 6). Memory, fantasy and desire are also central to how we perceive political activity and socio-political processes. Within a psychoanalytic framework the present is made up of memories, narratives and perceptions from the past (including the gaps and absences therein) as temporalities are fused so that no clear distinction exists between the past and the present. Phillips (2007) points out that what we think of as lost is never ‘quite as lost as we fear or indeed hope’ (p. 20). Colonialism endures and cannot be safely located in the past. The mind is a palimpsest as traces of the past remain, persist in the present, and endure, despite our best efforts to disavow them. They make themselves felt, pulsing away in the present. The palimpsest of the mind contains the social and political past as, from the very earliest moments of our lives, we are formed from and permeated by our relationships with others. We internalise profoundly dominant socio-political discourses and prevalent narratives in relation to history, events that have occurred, and their predominant emotions. Psychic processes are ‘inscribed not solely on the mind, but also on the body: they score the face, furrow the heart, flute the lungs, make ravines of hands whose fingers knot into mounds at each survived collision’ (Mukta, 2002, p. 179). An insistence that the past is behind us, done with, reveals an anxiety that the past is, in fact, profoundly alive in the present. The insistence that all has changed, that colonialism has been overcome, stalls the capacity to think about the subtle but various ways that colonialism endures. We have absorbed profoundly colonial structures that are full of violence, contempt and denigration. 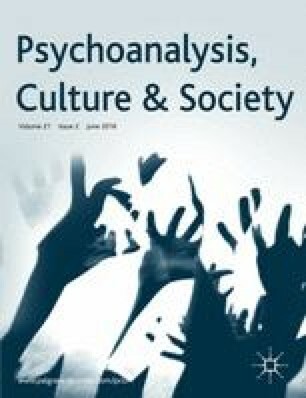 As I have previously written (Treacher Kabesh, 2013), psychoanalysis, ostensibly that most interior of paradigms, may seem a peculiar theoretical stance from which to assert that fantasy is not the most private of affairs, produced by the individual whiling away time in an attempt to escape the harsh realities of life. Rather, fantasy is precisely rooted in and formed by socio-political-historical conditions. As Rose (1998) explores, fantasy is not antagonistic to social reality; rather, it is its precondition or, perhaps more pertinently, its psychic glue. In short, fantasy is not a personal matter, an enduring aspect of subjectivity, but fuels or at least plays its part in the forging of the collective will. Emotions, fantasies, desire and identification are an interlinked web: each link is interwoven with other links to produce a complex and inter-connected network. Moreover, as Fuss (1995, p. 141) points out, identifications have a history, to which I would add that identifications are formed within (a) socio-cultural-emotional context(s). Like other Middle Eastern states, Egypt ‘is a culture that embeds persons in familial relationships. Personhood is understood in terms of relationships woven into one’s sense of self, identity, and place in the world. One is never without family, without relationships, outside the social body’ (Joseph, 1999, p. 54). As Joseph writes, the self is not sealed within boundaries separating self from others, as to be whole is to be part of the family and the community (p. 54). For example, my identity card contains my father’s, my grandfather’s and my great-grandfather’s names, and every time I use my card I am reminded of my connections and relatedness to the important men of my family and the importance of these bonds. (It is worth pointing out that a woman does not change her name on marriage, but retains the patronym.) Maturity, in Egypt, is not based on independence or autonomy, but rather is founded on embracing connections and relatedness, whereby people proudly declare that they are like their father, mother, uncle, or cousin. Joseph (1999) describes this as the connective self. Inter-generational transmission, therefore, is a continuous point of reference for being a self with others. Whether we are sons or daughters, fathers are inevitably folded into our most profound psychic investments and desires for reparation. Not only do fathers enable their children to gain subjectivity in particular ways (see Butler, 1997), but they are also, importantly, providers of love, care and sustenance. Via identification, on this view, the father is the child’s essential route into the socio-political order, as the son must resemble his father (Radstone, 2007, p. 171). Identification, however, can lock human beings into the past and into connections that should be refused if a different socio-political order is to be established. Identifications and loyalties are, needless to say, over-determined and ambivalent – ambivalent because ‘[d]esire follows unpredictable directions, its attachment to objects can neither be stabilized nor predetermined. Desire – its perpetual quest and the impossibility of its satisfaction – is a psychic determinant with historical effects’ (Scott, 2012, p. 80). Identification and disidentification are never straightforward and are frequently intertwined in that it can be difficult, if not impossible, to trace through the vexed pushes and pulls that do occur and make it difficult for human beings to know their own best course of action. This can be illustrated by an example of an incident that reportedly occurred during the January 2011 demonstrations in Midan Tahrir. While I have no idea if it actually happened, it has entered the mythscape of that phase of the revolution and it reveals its conflicting emotions and identifications. This is the story: on a day when Midan Tahrir was full of protestors, Mubarak ordered the officers to set the tanks on them. The officers, apparently bewildered and conflicted, rang their biological fathers to ask what to do. Their fathers told them to refuse out of loyalty to the Egyptian people. These officers, ethically conflicted, chose to identify with their fathers and to act within a moral code that states categorically that our loyalty should always be to the Egyptian people and the Egyptian nation. Colonialism, however, complicates our identifications with fathers and leaders, rendering them more ambivalent. This may be more problematic if our fathers, uncles, brothers, husbands and grandfathers have been seduced into colonial rule with all its contempt and degradation. I wonder if what we cannot tolerate is the vulnerability of our Egyptian fathers (this may be a universal question) and the precariousness of their status and power under colonial rule when, indeed, they lacked any authority unless it was borrowed or imitated. I am stalling here, anxious that I am being disloyal, fearful of betrayal, wanting to be protective, but the lethal combination of not being able to bear vulnerability and the wish to redeem hinders our capacity to think through the possibility that we are similar to our ancestors. We wish to disavow our history and assert we are not like that – we are over it. Above all, perhaps, what we cannot forgive is our fathers’ and grandfathers’ weaknesses, their inability to stand up to colonialism and overthrow colonial rule. The desire, inevitable and necessary, to get rid of the shame and humiliation of colonialism leads – in a profound irony – to the repetition of colonialism itself with its denigrations, exclusions and humiliations. As Egyptian daughters we feel protective and loyal towards our fathers. We find it difficult to question them let alone to distance ourselves from them, as we are bound to them so profoundly. Another layer of complexity within Egyptian culture lies in the prescription that to question or judge one’s parents is forbidden; idealisation of parents verges on an injunction. We are melancholic and at a loss, as we feel profound loyalty to our fathers. I grew up knowing, in those subtle and indefinable ways that children have of knowing the world, that my father did not have the same power or recognition as the white man. This unthought known (Bollas, 1987) has provoked disappointment in me, along with a simultaneous desire to protect my father. I have to acknowledge that I am disappointed that my father was not more powerful, that he could disappoint, and, above all, that he was (is) not the father of my dreams (Treacher Kabesh, 2013). This is vexed, as the desire to belong, to be loyal and to love exist alongside the perhaps brutal accusations that our fathers did not do enough, or that if they acted it was wrong/ misplaced/inadequate/fearful/complicit, and so on. The powerful and unconscious paradox goes along the following lines, ‘I want to be like you, and the last person I want to be like is you’, and operates despite the wish for it to be otherwise. We rarely ask the question: what does the father want? In my experience and observation, the answer is yet another omnipresent paradox: the father both wants the son and daughter to be like him and simultaneously not to be caught up in repetition. My father and husband want their children to agree with them, to confirm their viewpoints, and to obey unquestioningly; simultaneously, however, their children (whether male or female) are to think for themselves. Perhaps, above all, they want their children, especially their sons, to liberate themselves and to become men, echoing Fanon’s poignant desire ‘to help the black man to free himself of the arsenal of complexes that has been developed by the colonial environment’ (quoted in Hall, 2002, p. 14). I want to hold onto the value of this concept of maturity, while simultaneously raising my profound disquiet about the meanings embedded in identifying with a paternal network that has been colonised. I shall return to this point later, but for now I will elaborate the issue of transmission that is elusive, yet with powerful consequences for subjectivity. The French psychoanalyst Jean Laplanche conceptualises subjectivity as forged from the intrusions of others, usually the primary caretakers. Importantly, we cannot escape the intrusion of these caretakers. Drawing on a close reading of Laplanche’s (2000) important concept of enigmatic signifiers and their unconscious transmission, Radstone (2010) explores the film Caché, analysing how it lays open France’s colonised history with Algeria. As Radstone states, enigmatic signifiers transmit unconscious socio-political, familial messages. These are enigmatic as they are unknown to all; crucially for Laplanche, such unconscious messages cannot be metabolised. Laplanche concentrates on exploring matters of enigmatic seduction. He asserts that it is through the touch and physical care of the parent, who is also imbricated in and permeated by social meanings, that the infant takes in the enigmatic (but, nevertheless, material) injunctions of the socio-historical-political culture that is inhabited. Sullivan (2006) and Frosh (2002) elucidate how the unconscious is formed through relations with others who inhabit a material socio-political world. Frosh and Sullivan make explicit use of Laplanche’s theory of enigmatic messages to explicate the unconscious matter of white privilege that is psychically and somatically inhabited (Sullivan, 2006, p. 64). These meanings and injunctions are not passed down deliberately or with conscious intent and effect, for the parents and/or caretakers have themselves been the recipients of enigmatic messages. I have stalled frequently while working on this essay, staring out of the window as I helplessly try to grasp an example to ground what I am exploring. Alas, this has been fruitless precisely because what I and others of my generation have internalised is enigmatic and beyond the grasp of conscious thought. I can sense it, feel it, and know something is working away within me, but I cannot reach it. Our symptoms, as Phillips (1994) points out, are never just our own. These internalised relationships to history, to the colonised and coloniser, are embedded in the unconscious, stubbornly durable and relentlessly pervasive, because they constitute our deepest and most persistent attachments. Political and emotional imperialism colonises the imagination, thinking, and action, which paralyses the capacity to make and experience relationships that do not replicate hierarchies of superiority and inferiority. Despite the denial of the impact of colonisation and the stringent disavowal that Egyptian masculine subjectivity is partially built upon identification with the coloniser, much unconscious mimicry of the coloniser takes place. This problematic belief system is articulated and perpetuated both by previous generations and my contemporaries. Frosh (2012) writes that ‘vertical (time) and horizontal (space)’ hauntingly disturb ‘rational communication’ (p. 242). The dimensions of haunting for Frosh are interlinked, as ‘vertical refers to what gets transmitted from one time period to another, from one generation to another, so that those who have no direct experience of an event may nevertheless be affected by it’ (p. 242). Horizontal haunting refers to ‘the permeability of personal boundaries’ and conveys ‘what passes between people whether or not they are in active communication with one another’ (p. 242). As Homi Bhabha (1986) writes, in drawing out one link between disavowal and identification, ‘disavowal of the Other always exacerbates the “edge” of identification, reveals that dangerous place where identity and aggressivity are twinned. For denial is always a retroactive process; a half acknowledgement of that Otherness which has left its traumatic mark’ (p. xxii). I think back to the anniversary of the 1952 revolution that was officially full of the discourses of triumph and celebration, while, in private, my father and many men of his generation and class were crying. Their tears contain many meanings: partly nostalgia for a time when their future was there for the making, partly disappointment over the failures; and partly, I hazard, a half-acknowledged sense that their identities, emotions, responses and behaviours had been more formed within colonialism than they could bear. My family comments both affectionately and ambivalently that my father was ‘miya-miya’ (meaning 100%) English and it is worthy of note that both my (English) mother and (French) stepmother came from colonised countries. My father was proud that ‘I am more English than the English’ and yet knew that he was at the end of the prevalent and maddening injunction to ‘be like us, but remember you will never be like us’. Freud’s account of identification is, according to Fuss (1995), a ‘tale of interiors and exteriors, boundaries and permutations, transgressions and resistances’ (p. 35). It is a means of gaining control over the objects outside itself. Identification in Egypt is based on a colonised history and a post-colonial and post-imperial context, which I argue is also based on a double identification. Shot through these identifications is an internalisation of the view that the colonised Egyptian is without history (except for the romanticised history of the Pharaonic times) and, more problematically, that colonised Egyptians are primitive and without minds. Identification with the coloniser is based on a repudiation of inferiority and is an assertion that Egyptians are rational, strong, civilised, and without emotion – just like the coloniser. These precarious assertions of superiority are in turn founded on an identification with the coloniser’s own haughty and confident self-image. Identification based on mimicry is problematic as the identification is forged on the illusion that power and recognition are equal between the ‘white’ person and the person who is othered. Fuss (1995) argues that Fanon considers the ‘possibility that colonialism may inflict its greatest psychical violence precisely by attempting to exclude blacks from the very self-other dynamic that makes subjectivity possible’ (p. 142). In short, the black man is not even in the place of the other and is excluded from ‘full cultural signification’; further, ‘the implications of his exclusion from the cultural field of symbolization are immediate and devastating’ (p. 143). Having been incorporated into the psyche of the white man, and indeed devoured, Egyptian men unsuccessfully attempt a project of ambivalent assimilation. As Goffman (1952) points out, mimicry always evokes humiliation when people know they are not the right thing, and feel the madness of pretence, the emptiness and hideous familiar feeling of fraudulence, of ‘loss of face’. As Goffman asks, ‘at what points in the structures of our social life are persons likely to compromise themselves or find themselves compromised?’. In the lives of the colonised, or those who have inherited a history of colonisation, compromise and mimicry are, in fact, ongoing. These colonial attitudes and values persist in the oft-heard comment and belief among many Egyptians that Egypt can never be a democratic country. Egyptians, according to this dominant viewpoint, need a strong leader who will lead with strong authority for the good of the nation. In this context, the oppressive rule of Nasser and Al-Sisi remains unquestioned, and, more problematically, repressive dictatorship is heralded as necessary and desirable. It is almost impossible to question a country’s dominant belief system as its values are reinforced by peer groups that have a strong role in the horizontal transmission of beliefs and ideologies focused on perpetuating a refusal of thinking creatively and effectively. Fear is a key component in repetition and should never be underestimated: our fear of alienation, fear of losing the love of friends and family, the fear of not knowing to whom or where we belong. To deny fear, Rose (2014) asserts, is ‘as ineffective as it is absolute. Nothing, we might say, is more dangerous than the repudiation of fear – at which men (often) and nations (regularly) excel themselves’ (p. 10). Identification is full of ambivalence, as it allows us both to hate and love. Fuss (1995) points out that the double current of hate and love allows ‘for the possibility of multiple and contradictory identifications coexisting in the subject at the same time’ (p. 34). Identification is over-determined and violence, as Fuss rather pithily points out, is one aspect of identification (p. 34). The other provokes and evokes anxiety about who the self may have been and/or may, in this precarious life, become. Cairo at present is full of such reminders of our vulnerability – there is an escalation of begging on the streets; all families know of at least one member who is unemployed, and, indeed, the possibility of employment in their lifetime is at best slim, and at worst impossible; conflicts and civil wars know no geographical boundaries and Egyptian citizens witness the appalling events in Syria and are affected; moreover, there are now many Syrians in Cairo struggling to survive by undertaking low-paid work. Very near where I live, for example, a Syrian woman sells products that she baked that morning from a rickety table on a street corner. I could provide numerous examples that are forceful reminders of such fragility and precariousness, reminders that have powerful effects. Identification with the vulnerable can lead to compassion and a wish to reach out to others who are less fortunate; or it can lead to a cruel dismissal. Disidentification with vulnerability, precariousness and insecurity are currently dominant, as there seems to be little compassion or ordinary kindness in the relentless repudiation of any internal weakness. Bollas (2011) warns us that the dehumanisation of the other ‘has the function of squeezing out humanity and preventing human understanding from modifying the cruelty’ (p. 82). An important aspect of Egyptian masculinity focuses on being strong and inviolate. There are strong attempts to repudiate inferiority that exist alongside doubt and uncertainty and this partly involves, as explored above, a dismissal of vulnerability alongside the conviction of prevalent belief systems. As Bollas writes, ‘[i]deological certainty... in spite of its binding of the self through simplification and the exile of other views, is threatened by a sudden breakthrough of the pushed-aside thoughts, which now must be dynamically ordered by an over-decisiveness’ (p. 84). In the attempt to be recognized as subjects, it is no wonder that mimicry, assertion and adhesive identification take place. In Egypt, adhesive identification takes place in two inter-linked ways: firstly, through the assertion that we Egyptians have minds, are rational and superior to others from elsewhere (an othering of others that recurs relentlessly in Egypt); and, second, through the fantasy that Egypt and Egyptians are in control of their destiny. Mubarak and Nasser drew specifically upon the rhetoric that being beholden to the British coloniser is over and done with. On the evening before his resignation as President of Egypt, Mubarak made a desperate speech in which he appealed to the Egyptian people that he was the Leader and, importantly, the Father of the Egyptian nation – concentrating on how he was, moreover, an anti-colonialist leader, an assertion immeasurably legitimated by Obama’s demand that Mubarak resign. Mubarak reiterated that his fate was up to the Egyptians to decide, and, in this way, he was implicitly but powerfully reminding Egyptians of the period of colonisation and the continual threat of the return of oppression. Crucially, he appealed to a strong Egyptian desire to return to the Nasserite time of being an anti-imperialist nation. It is puzzling and deeply worrying that so many of the Egyptian population seem to accept the role of the state in Egypt with a resignation that at this present time is profoundly entrenched. It has become commonplace to declare that the state is now more oppressive than ever, but I do not know if this assertion is true: Nasser cruelly and harshly repressed any dissent, imprisoning members of the Communist Party and, as is well known, members of the Muslim Brotherhood. The Muslim Brotherhood in the 1950s was declared an illegal organisation. While during 2011-2013 it was declared legal, it is once again an illegal organisation and perceived as a terrorist group. ‘Egypt Against Terrorism’ was the tag line in Egypt during the summer of 2013. I do not know what I now think about the Muslim Brotherhood, as I was brought up to think of them as primitive, mindless and cruel. This powerful stance was dominant during my childhood and adolescence, and the dismissal of the Muslim Brotherhood took place both within my family and the wider culture. I have so completely internalised this pervasive viewpoint that I cannot find my way to a truth; indeed, I cannot even hear myself think. However, it is not just the Muslim Brotherhood that is being oppressed but also members of left wing parties, and, as is well known, journalists from Al-Jazeera are imprisoned and many political agitators are subject to torture. Cultural commentators, including the well-liked satirist Bassem Youssef, are continually at risk of being gagged; indeed, the risk to the safety of his family has forced Bassem Youssef to end his popular TV show. At present the military dominates through the oppression and suppression of political opinion, while President Al-Sisi’s tight control of Egypt is widely perceived by many as ensuring the safety of Egyptian citizens as necessary and proficient. It is the need for strong leadership that facilitates Al-Sisi’s fervent popularity, underscored when he told Barack Obama that Egyptians would rule Egypt. This widely perceived anti-colonial stance was greeted with relief, joy and the profound belief that Egypt would finally be independent of foreign interference. In short, both Nasser and Al-Sisi are held in especial esteem in the beleaguered psyche of many Egyptian citizens because of their assertions that Egypt is historically ‘superior’, due to our Pharaonic history. Second, because we are ‘superior’, unlike other nations in the Middle East, we have overcome the past. In this respect, we are not, apparently, like Syria, Libya and/or Iraq. This dominant narrative conceals from hearts and minds the loss of the 1967 war against Israel. This humiliating defeat, argues Aburish (2004), has led to Egyptians ‘living in the shadow of that event…They are taunted and haunted by it’ (p. 250). We hope it will be different, we invest in Al-Sisi, and we yearn for a more promising future, but we do not really speak of hope, dignity and pride any more. Much melancholia derives from that which has never been, cannot be recovered or restored, and has never been possessed in the first place. Identification is a partial means of managing loss, absence and fractures. Drawing on Hannah Arendt, Rose (2014) asserts that totalitarian regimes hate new beginnings. New beginnings, precarious attempts to reach for different states of mind built on altered relations between self and other, and changed understandings of the persistence of the past in the present, have to be oppressed out of existence. It is therefore ‘each new birth that totalitarianism hates’, writes Rose, who goes on to argue that terror is needed in order to ensure the continued existence of the status quo and to quell any dissent (p. 4). The new threatens the regime and puts pressure on corrupt socio-political-emotional structures. We are all contaminated by inhabiting immoral societies, whether through fear, the need for status and material security, indifference, and/or violent repudiations of vulnerability. My father’s copious tears, I suspect, were due to his broken dreams, hopes and overwhelming sense of loss. I imagine that his state of mind, and he was certainly not alone, echoes a similar view that is dominant at this period of time in Egypt. The following is a description that I am too inside of to be able to stand back from. It is near the end of 2014 and I am in my home in Cairo where I live part of the time. The air is heavy with dust and sand so that it is difficult to breathe. I feel as if I am living in a fog. People seem to be walking on eggshells and are unusually subdued, withdrawn and thin-skinned. Everyday life is freighted. We comment to one another that we ‘do not know Cairo’, ‘people are not the same’, and we ‘do not quite recognise where we are’ (we mean this metaphorically). We do not quite linger on these comments, as if we are fearful to follow through on these asides, and cannot quite bear to know the implications of our perceptions and feelings. I want to leave; I am struggling to be here because I cannot bear the loss of a Cairo I once loved. Our conversations focus relentlessly and hopelessly on the socio-political situation and on imagining the future. Persistent political upheaval can make it difficult to know where, and to whom, you belong as it throws the self and all that can be taken for granted off balance. My grateful thanks to Lynne Layton for her thoughtful editorial expertise and to Lene Auestad for comments on an early draft. Goffman, E. (1952) On cooling the mark out: some aspects to failure. http://tau.ac.il/algazi/mat/Goffman&ndash;Cooling.htm, accessed 5 March 2012.